DT NO.1 is back again with a new smartwatch called NO.1 DT28. but this time with more features especially ECG and PPG function plus the mobile payment. Let check the full specs. The NO.1 DT28 smartwatch comes with a stylish round look, which is available in black and silver color. the body is made of stainless steel, while the strap is removable and available in silicon and Milanese strap with 22mm. the smartwatch also has a 1.54 inch TFT screen, 240 x 240 resolution display with touch screen operating mode. 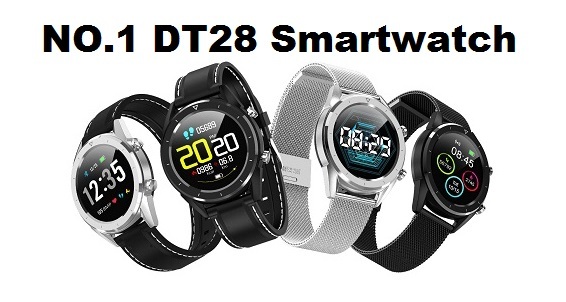 The NO.1 DT28 is an IP68 waterproof smartwatch with multi-sports mode "Running, Walking, Swimming, Cycling, Basketball and so on". while the health and fitness features are Heart Rate Monitor, ECG, Blood Pressure Monitor, Sleep Monitor, Pedometer. Additional features are mobilepayment "Alipay offline, easily payment by using smartwatch", Bluetooth, Call or message Reminder, Alarm, Calendar, Sedentary reminder, Camera remote control, Anti-lost. it has 250mAh Li-ion battery with 20days Standby Time and 6 days of normal usage. The NO.1 DT28 is available at Gearbest for 32$.